By this point in time, if you've not heard the name Machine Head, please hand in your metal card at the front desk on your way out. Their most recent studio effort, 2007's awesome The Blackening, was featured in many a Top 10 list, and, in fact, it topped many of those lists as well. Their return to form and rise to the top ranks of today's metal scene has been well documented and some 18 plus months after the release of The Blackening, Roadrunner Records are overhauling it with the two CD/one DVD special edition treatment. The first disc is The Blackening as per the original standard edition - that is, it doesn't include the band's cover of Metallica's Battery (which originally appears on 1986's Master Of Puppets. 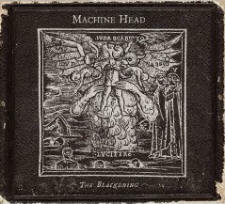 This cover was featured on the deluxe edition of The Blackening when first released. The second disc, dubbed B-Sides/Rarities 1994-2008 is exactly as the name suggests - a collection of out of print bonus tracks, rarities and never before released versions of songs covering the band's career to date. Going back to the Burn My Eyes era, we have Machine Head's cover of Poison Idea's Alan's On Fire, Old single B-side Hard Times (originally by the Cro-Mags); from The More Things Change... era, we have album bonus tracks My Misery (which differs to the original version found on the Tales From The Crypt: Demon Knight soundtrack), The Possibility Of Life's Destruction (originally by Discharge) and Colors (originally by Ice-T), and Take My Scars B-side Nirvana cover, Negative Creep. Also included is the previously unreleased extended version of Ten Ton Hammer which contains an noticeably extended intro. From The Burning Red days, the band's Bad Brains cover of House Of Suffering and the Supercharger era Black Sabbath cover, Hole In The Sky. Rounding out this disc is the originally U.S.A. only available Seasons Wither (from the U.S.A. release of Through The Ashes Of Empires) and their Iron Maiden cover (Hallowed By Thy Name) and 2005 demos of Halo (I Want Your Soul) and Aesthetics Of Hate (Thrash-terpiece). Whilst by no means complete as far as B-sides and rarities go, the second disc certainly offers up a good mix of out of print and previously unreleased material for fans. Perhaps for some, the real meat and potatoes of this whopping special edition will come in the form of the DVD, of which the bulk of it is live footage. Whilst the majority of the three tracks (Clenching The Fists Of Dissent, Now I Lay Thee Down and Halo) from 2008's With Full Force festival, the two from 2008's Rock In Rio (Aesthetics Of Hate and Davidian), the two from 2007's Download (Imperium and Old) are new material, it's the Burn My Eyes 10th Anniversary 2004 show that is sure to get people's attention with A Thousand Lies, The Rage To Overcome, Death Church and Blood For Blood being featured here. It would have been awesome to get the entire show of course, but this is better than none at all. Rounding out the DVD component are the three music videos from The Blackening - Halo, Now I Lay Thee Down and Aesthetics Of Hate and their associated Making Of segments. Well this truly is a special edition. Sure, we could banter and argue about what should have been included but didn't make the cut, but sure enough, what has made the grade certainly offers up plenty of new material both for the eyes and ears. If you don't have The Blackening - and why not? - then this is clearly the version to get. Hell even if you do have The Blackening and you're a fan, then you cannot go past this reissue. Yes, it's that bloody good!